The Wisconsin Tennis Association Multi-Cultural and Adaptive Committee announces the 2011 Wheelchair Tennis Program. 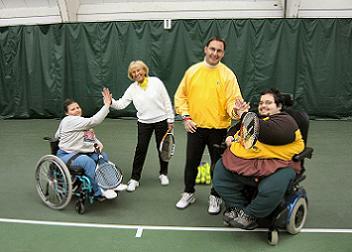 Players are invited to try or continue playing Wheelchair Tennis. Lessons are offered for children and adults throughout January and February, at Bluemound Elite in Brookfield. Lessons will be held on Saturdays beginning January 22 - February 26, 2011. Instruction for children up to age 18 will be from 3 pm – 4 pm. Adult lessons will be held from 4 pm – 5 pm. Bluemound Elite is located at 600 Barker Road, Brookfield, WI. Professional instruction has been offered for 21 years by USPTA Wheelchair certified Tennis Pros Jackie Egelhoff and Brian Egelhoff, USPTA Tennis Professional Barb Mueller and wheelchair certified instructor/wheelchair player, Jason Miller and volunteers. Contact Jackie Egelhoff at jegelhoff@sbcglobal.net , 262-242-5634 for additional information. See you on the court. Spread the word.